Founded in 1996, The Ruscoe Company is a mid-sized organization in the adhesive and sealant companies industry located in Akron, OH. It has 64 full time employees and generates an estimated $13.7 million in annual revenue. Perfect for Sealing Gutters & Downspouts, Chimney Flashings, Etc. 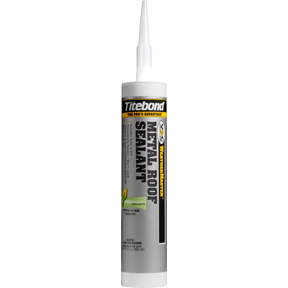 Titebond WeatherMaster Metal Roof Sealant is specifically formulated to outperform all other sealants technologies, including VOC solvent, silicons, tripolymers and urethanes. This superior polymer formula provides a weather-tight seal against water, wind, dust and dirt. It offers exceptional adhesion to Kynar coasted metal, aluminum, steel, galvanized bonderized surfaces, plastics and glass.